I have a chocolate tortie point Siamese cat. I adopted Yoshi Princess on December 26th 2010 from a lady not too far from me. 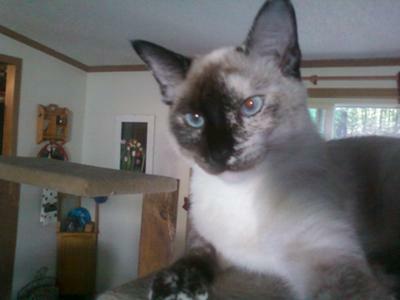 I really lucked out with her because I'm sure a cat of this or any Siamese breed would cost over $300 ... she was free! Nothing wrong with her at all, but I'm not sure the lady really knew what she had. Yoshi is very sweet but definitely has that Siamese attitude, and I'm sure sharing the house with five male cats doesn't help! 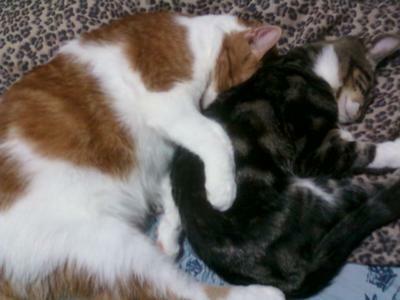 One of her pictures is when she was little cuddling with brother Remmy. Another is her enjoying a pretty fall day with my husband and I. He was very skittish for about two weeks, constantly hiding under the bed, but he finally came out of his shell and gets along really well with the others. 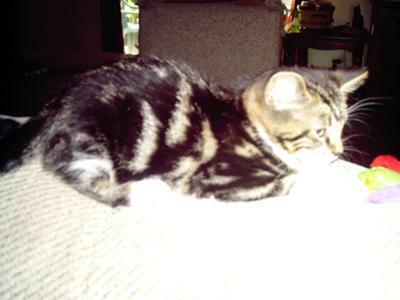 Very unusual markings as I've never seen a cat with stripes AND spots, maybe a mackerel tabby? 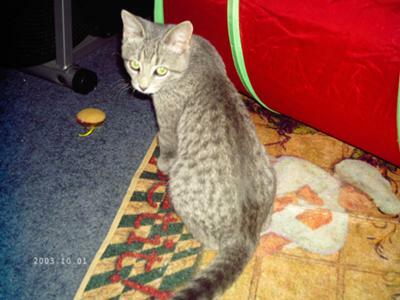 I thought maybe he was Ocicat as he has the right markings and green eyes, but was told by a breeder that he was not. Still, very pretty and lovely silver "steele" coloring! He loves chasing us through the house and jumping on top of the cat towers to swat at us as we walk by, such a clown! Also any time the other cats need a bath, especially Yoshi Princess, they go see Remmy and he cleans them up! Moose is our big boy. 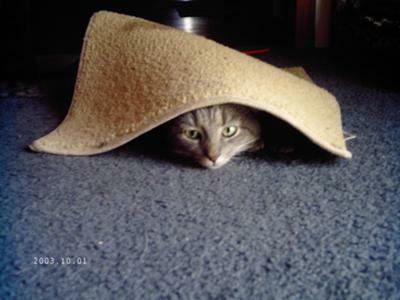 We adopted him at eight weeks old along with his kennel mate, Smudge, who was probably twelve weeks at the time. They were both so cute and we could not leave either of them at the shelter. Moose is such a big teddy bear, very laid back, but definitely wants to be the alpha male. He outweighs all the others and cries if he can see the bottom of his dish! His meow cracks me up, it's more of a hoarse crackled cry. 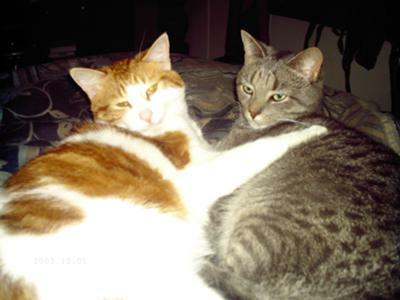 I think there must be a connection with that kind of meow and the orange and white cats, as my friend has one and so does my sister-in-law, and all three meow like that. Very funny! 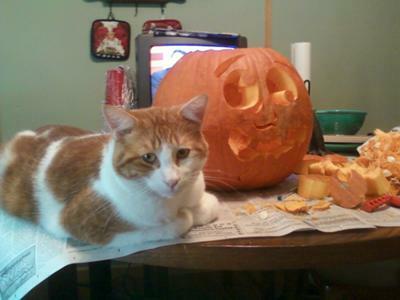 Moose and Halloween Pumpkin - lookalikes! 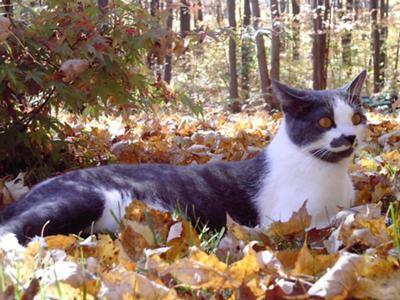 Smudge … well, the markings on his mouth speak for his name! Smudge was adopted with Moose from a local shelter and is a few weeks older; very sweet, slightly skittish boy. They are both two years old now. When he is content and wants attention he sticks his legs out in mid air and it looks like he's dog-paddling! He also drags himself across the floor towards you instead of getting up to walk, its very funny! But he makes up for it in sweetness! Manos is our littlest and newest to the family. We named him Manos, Spanish for "hands", because he has these huge paws and they are adorable! We also call him Manny. My stepson was over at a friend's house one night and his friend's girlfriend had brought home this kitten from a trip downstate expecting it to be OK for her to keep. Well, that didn't happen. The house she lived in had several large dogs and the mother told her NO! She made the kitten sleep outside in their jeep that night and my stepson didn't want to see anything bad happen to him, so he brought him home and told me about it the next morning, knowing I'm a sucker for a cute cuddly kitten! I had been wanting a marbled pattern kitty for so long or a Bengal, and this is exactly what Manos looked like and I couldn't say no to him. He was pretty growly and defensive for about six days, then all of a sudden took a 360 degree turn for the better. He's so cuddly, sweet, and funny and just beautiful. I'm very thankful to have him as a part of the crew! What a beautiful household! 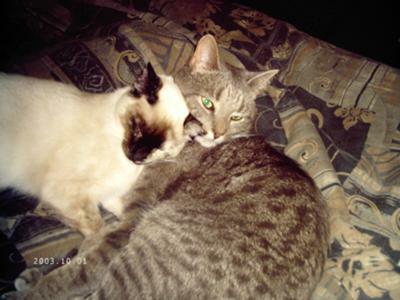 Nena, thank you for sharing all the cats' stories with us; it's good to hear of so many cats (especially where there's a Siamese involved) all getting along so well. Yoshi Princess is very lucky to have so many gorgeous 'brothers'! 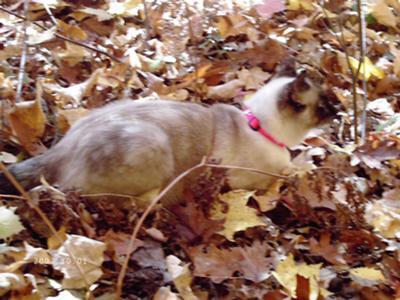 Return to Tortie Point Siamese Cats.